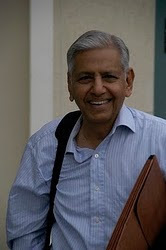 Ramaswami's April Newsletter, presented in full below, on the length of the inhale and exhale, his upcoming schedule, the recent tragedy in Japan, chanting mantra's as well as the different types of mantra and prayers, Krishnamacharya, the beautiful ghosha santi mantras and some additional notes and quotes. or pranayama practices one could practice with this goal in mind? I thank you in advance for your time and attention to this question. not feel rushed for breath, then you can slowly start your inhalation. fury of nature and/or the sufferings one undergoes during these times? supposed to protect the one who meditates/chants the prayer mantra. chant, he looked at me and asked how I came, I said in my car. immediately asked me to take him to a particular hospital in the city. suddenly complicated. I could see that my Guru was worried, concerned. faith in all these mantras also would have taken a beating. But no. The Ghosha santi mantra he chanted is a beautiful and profound piece. to predict or control these acts. bhoutika or the other beings like my neighbor, stray dogs, war etc. have a good night's sleep without those excruciating nightmares. consigning the mortal remains to the sacred fire, the last rites. Then there are mantras and prayers used for specific situations. used to climb out of a hole, out of desperate situations. rate of about 3 hours per day. I felt a little peaceful afterwords. dramatic turnaround in a very short period of time. force/being even if they do not pray routinely. Let there be Peace alone in me. May there be Peace in me, Peace alone in me!! Mantra Yoga in my book “Yoga for the Three Stages of Life”. brain and the heart. Some call them as the King and Queen of asanas. *** The tongue (jihwa) has two tendencies/weaknesses (chapalya). Patanjali Maharshi, he has all the answers. Krishnamacharya's Yoga Makaranda .....at last. So what's with all the chanting?